Almost halfway through my 30x30 and there are pieces I haven't even worn yet. I'm pretty sure I could have gotten away with only 20 pieces, and I'm thinking I have way too many bottoms and jackets, but it's nice to have options at this point when you look in your closet and see the same stuff over and over again. Hence, today we introduce the olive jacket and black pants into the mix. PS - I put on this lipstick around 2:30ish and these photos were taken at almost 6! That's some serious staying power. I'm in love - Lipstick Queen Sinner (my shade is Scarlet Red). Both of these pieces were included in my 30x30 thanks to not only their popularity early this year (this jacket was a staple in my trip to California!) but their extreme remixability. Yup, making up words over here. I'm still on the hunt for a great black pant in a dressier fabric, but this pair is comfortable and casual for running around town. All of this comfy knit fabric was perfect for an evening of Gus' Fried Chicken followed by seeing Hello Dolly with my girlfriends. 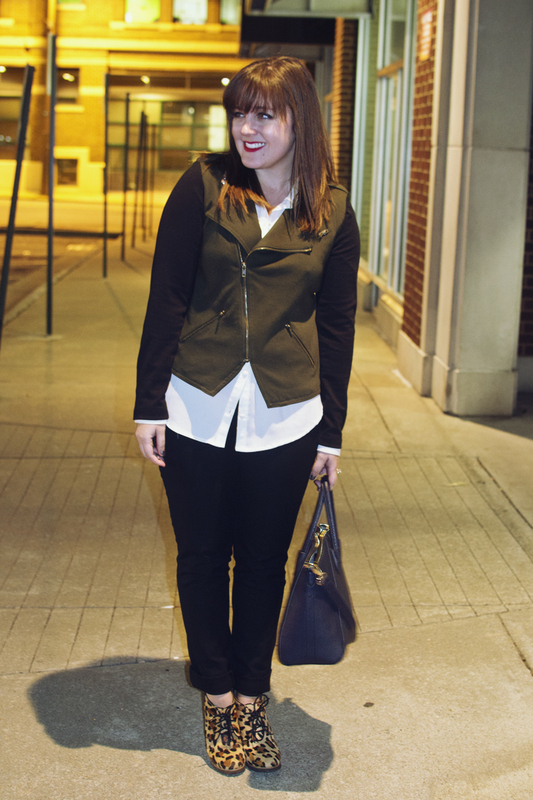 Olive jacket, Target (similar on sale!). Leopard booties, ShoeMint (similar from Kate Spade on sale). Navy bag, JustFab (similar from DSW). White button up, Forever 21 (Similar on sale - extra 50% with code EXTRA50! ).